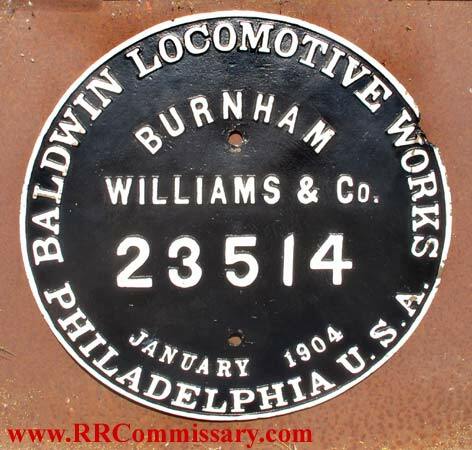 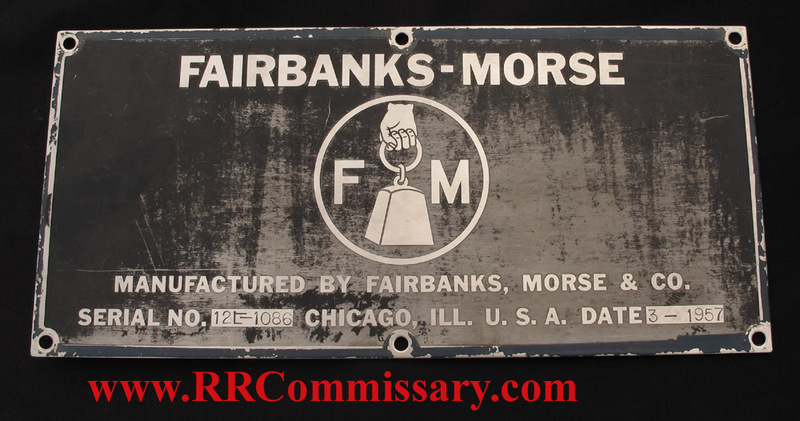 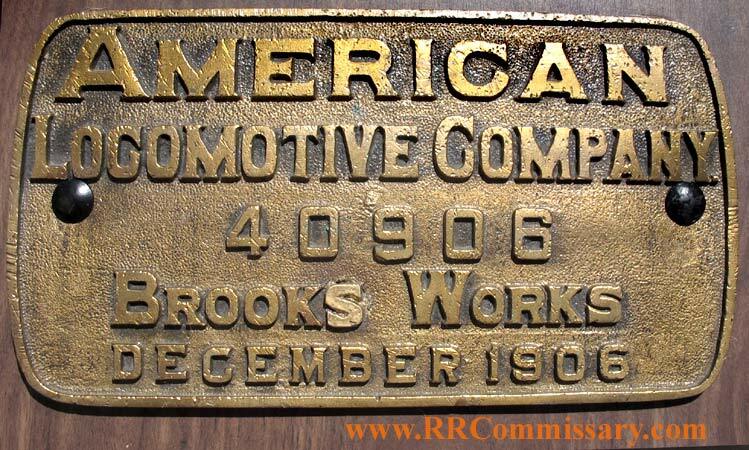 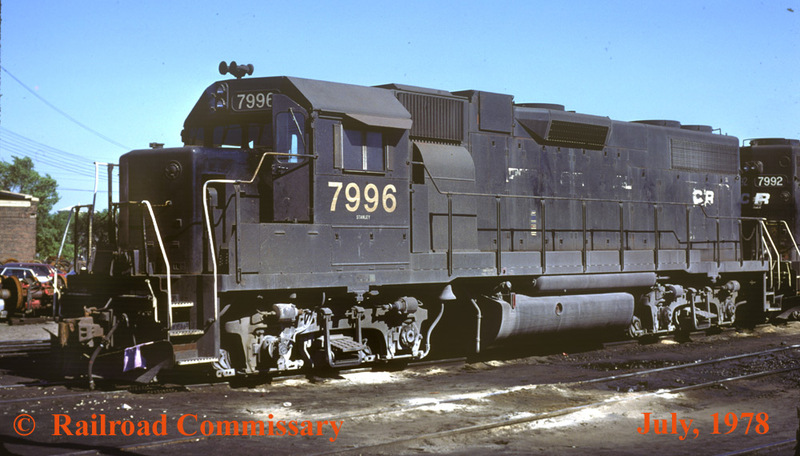 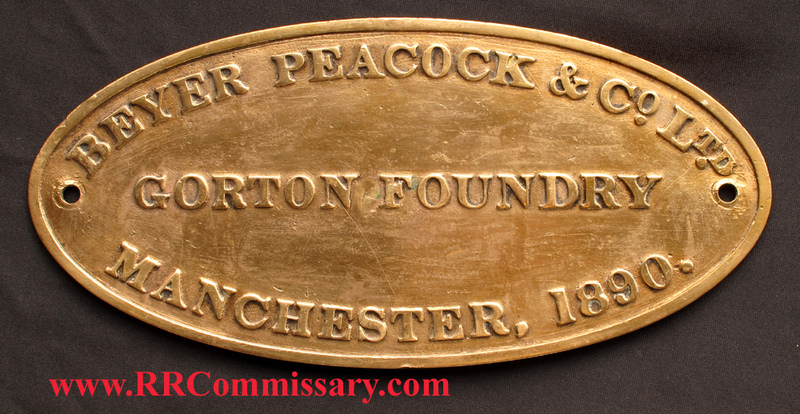 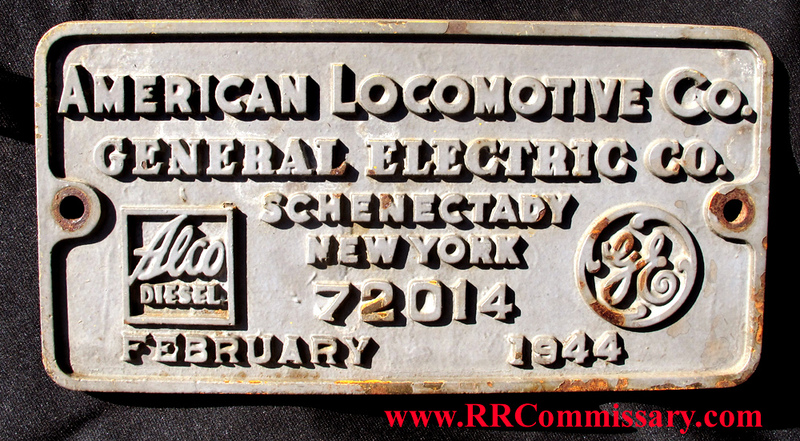 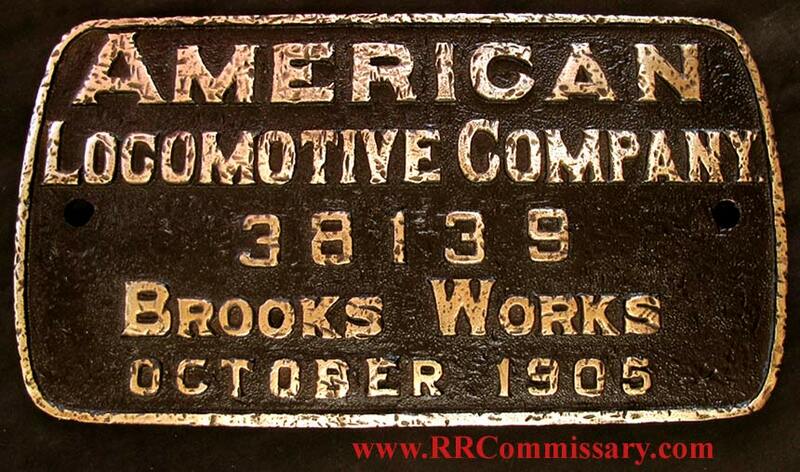 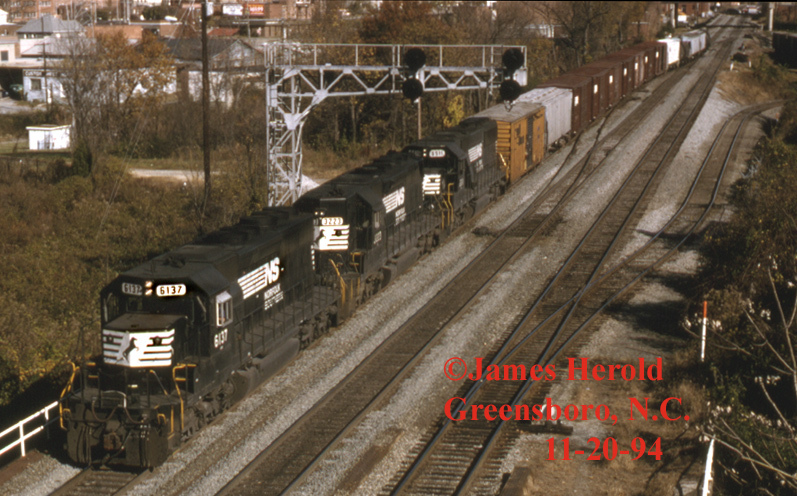 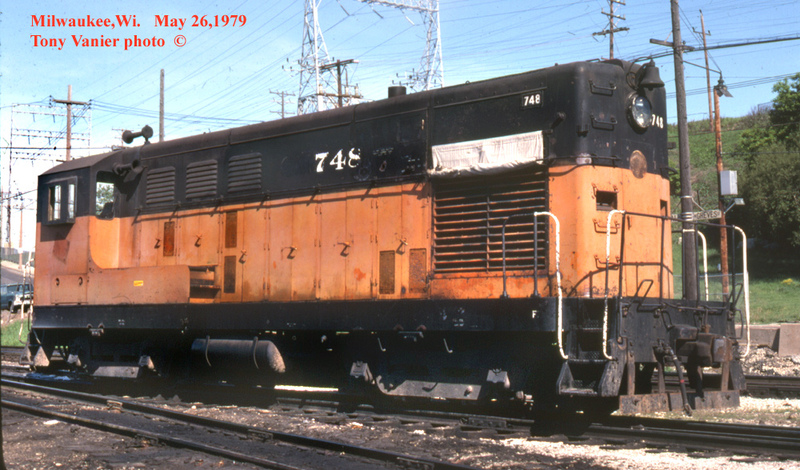 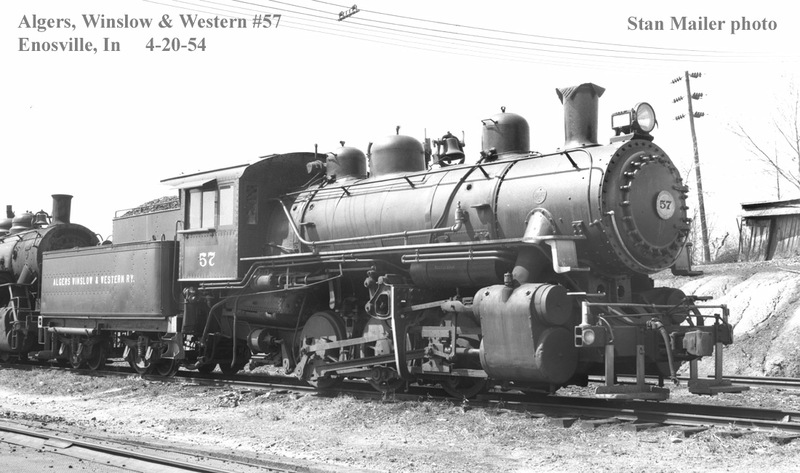 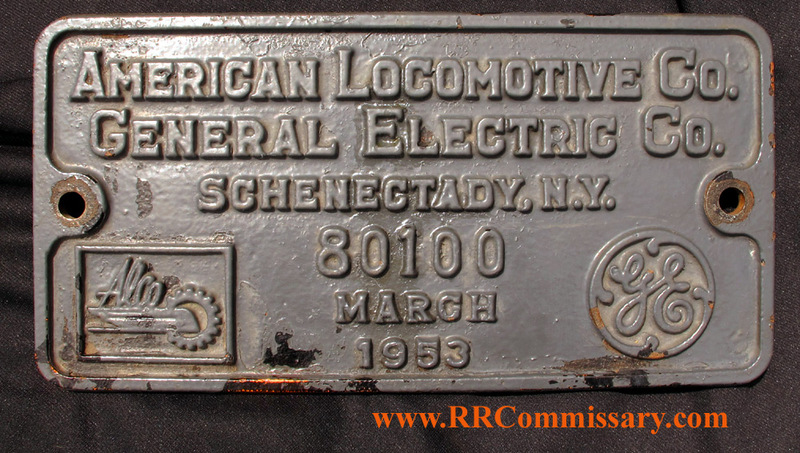 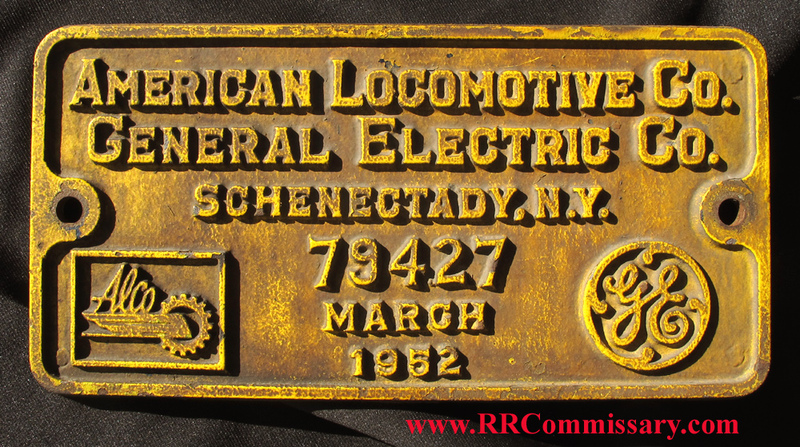 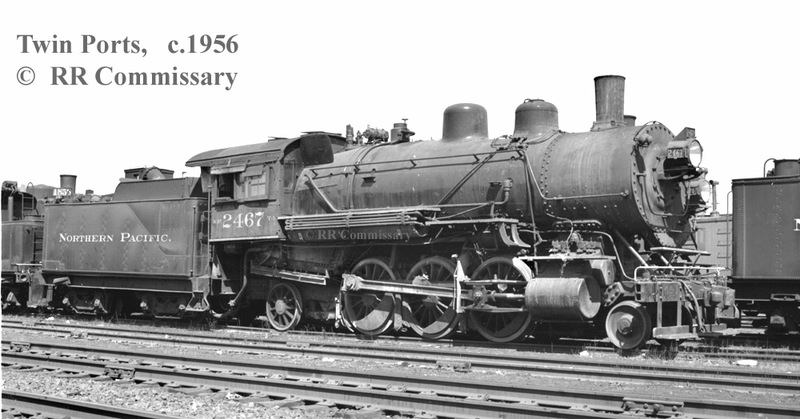 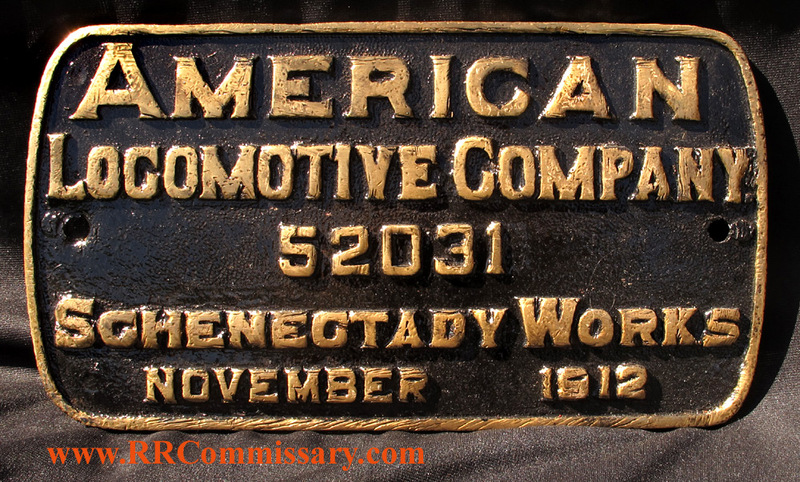 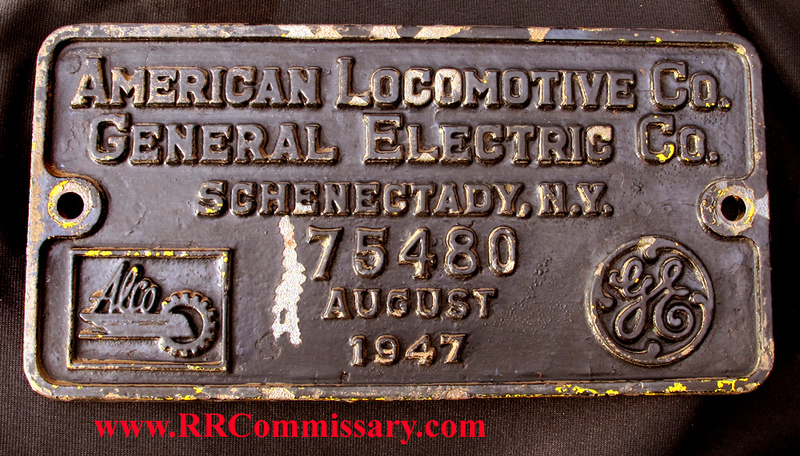 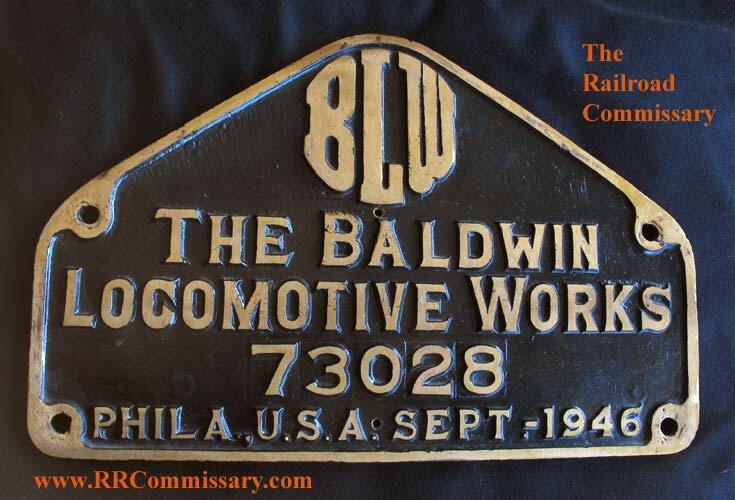 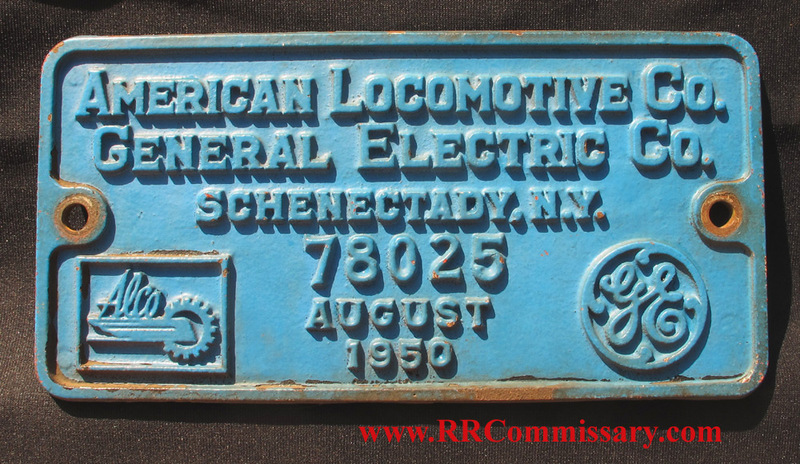 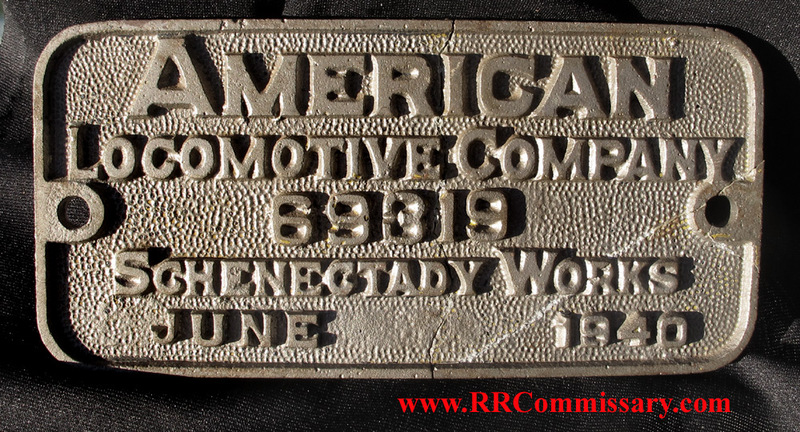 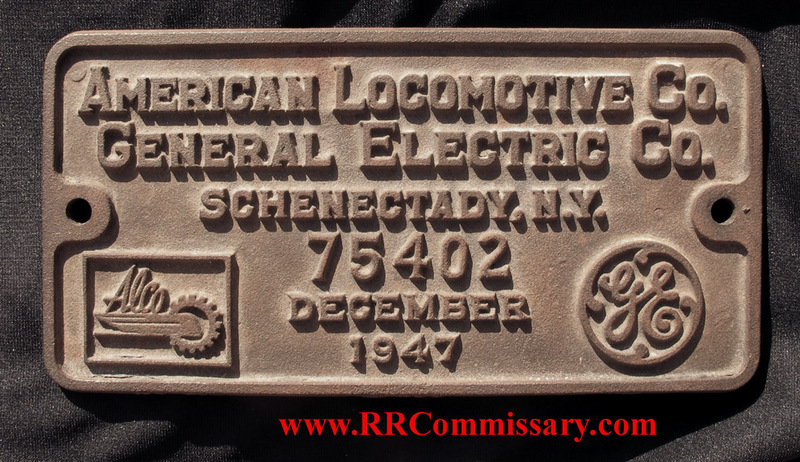 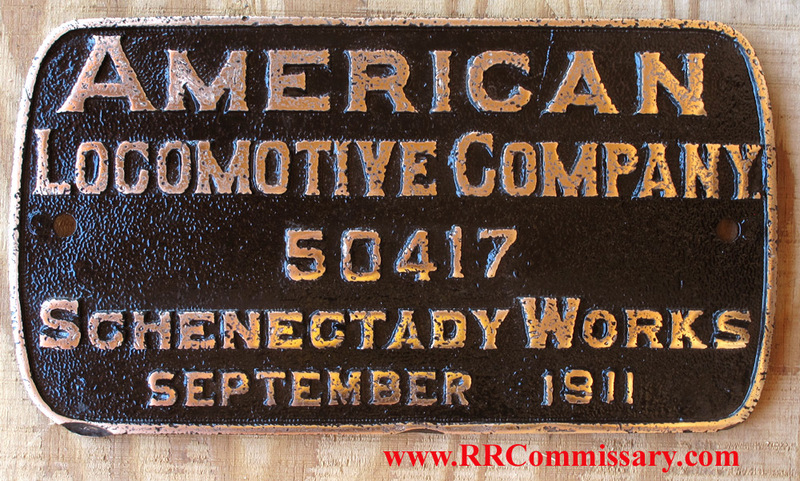 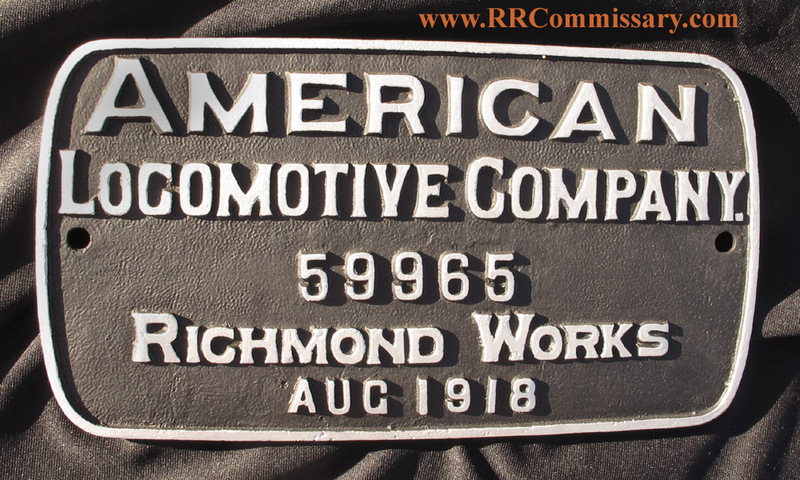 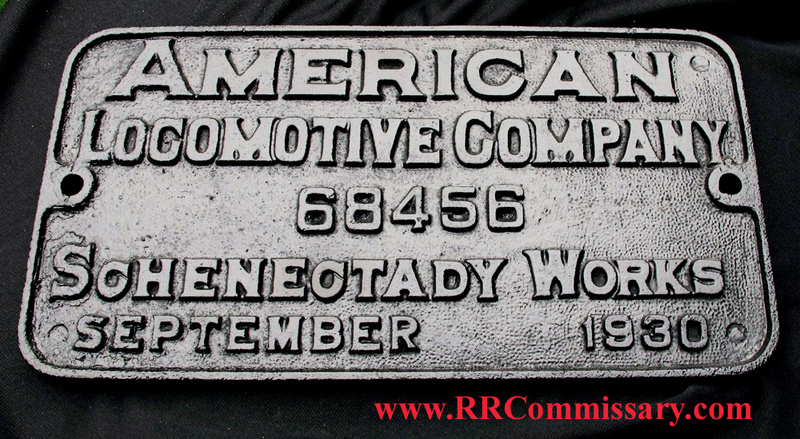 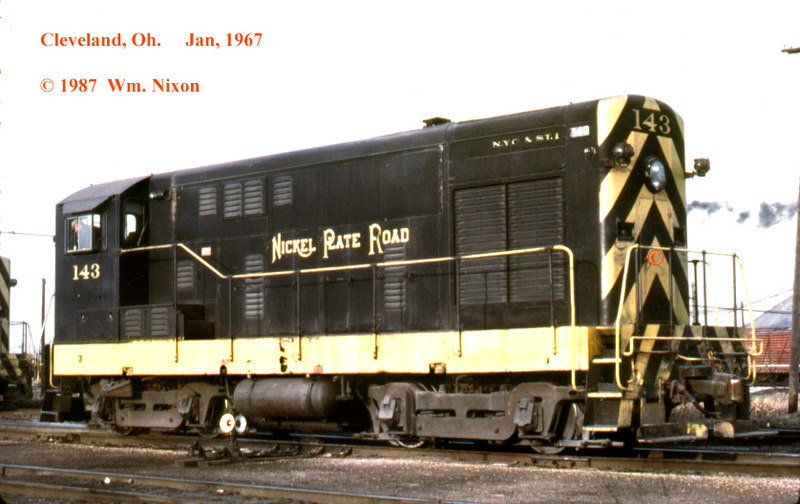 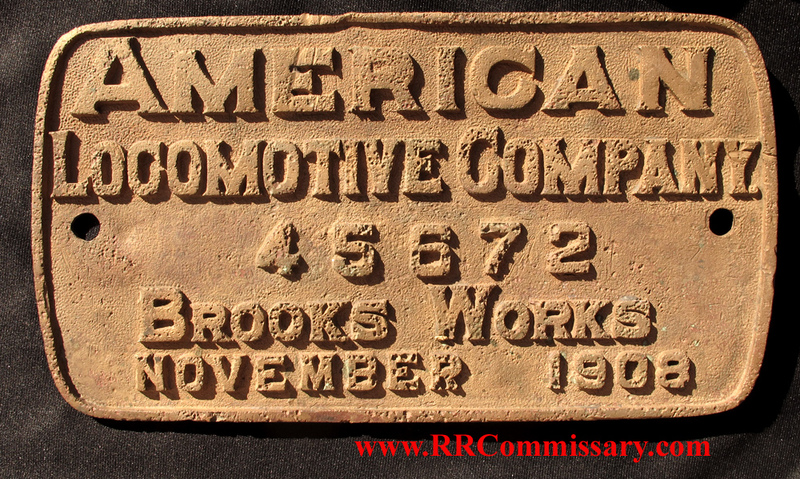 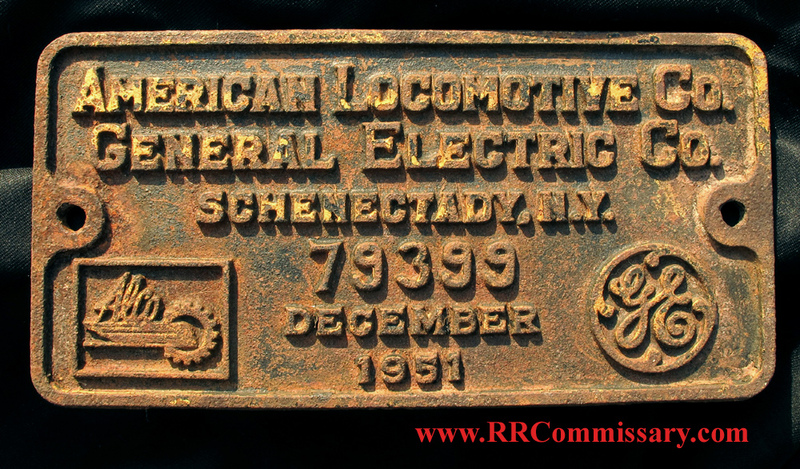 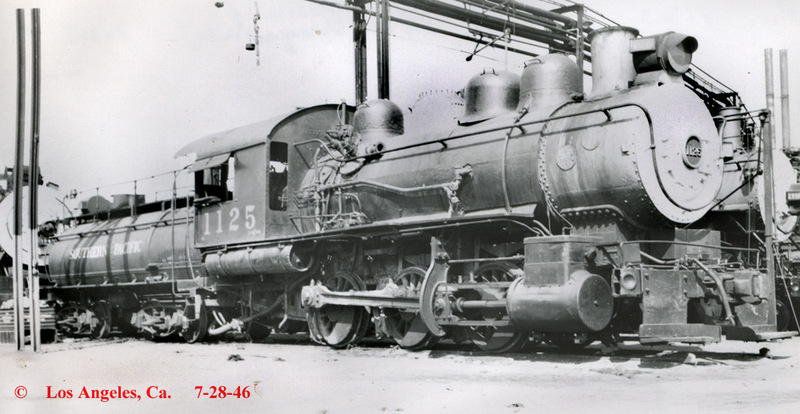 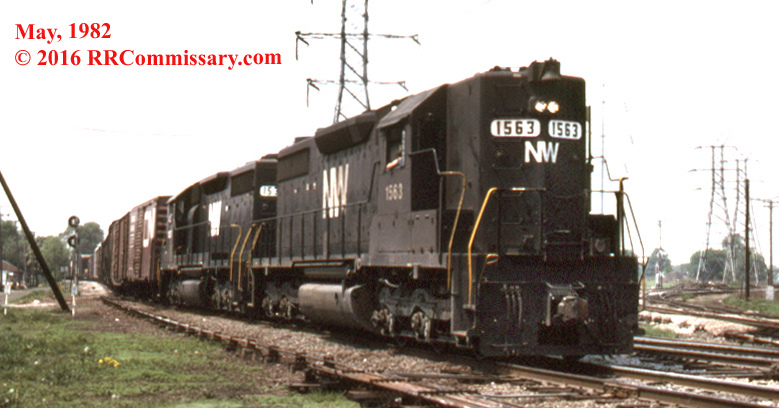 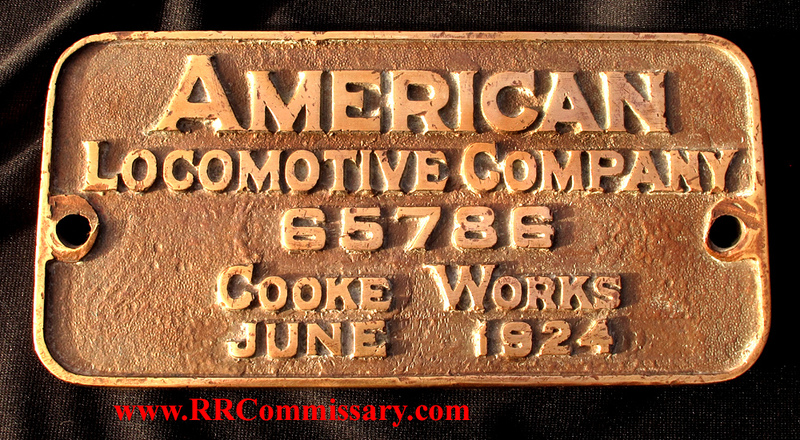 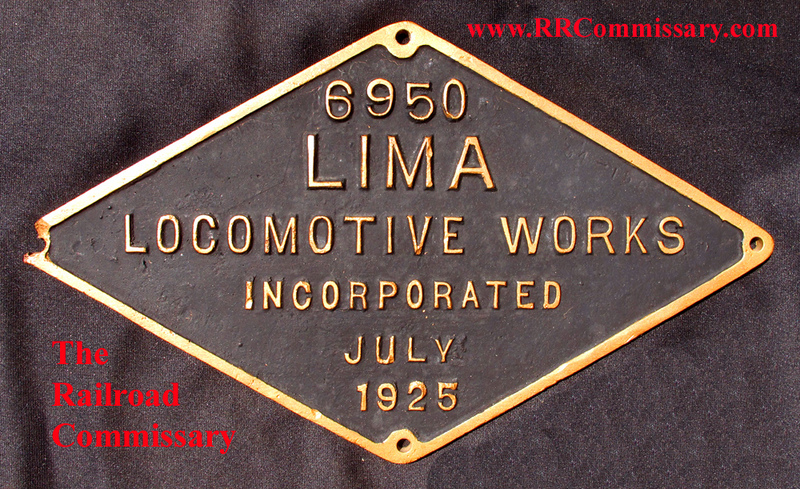 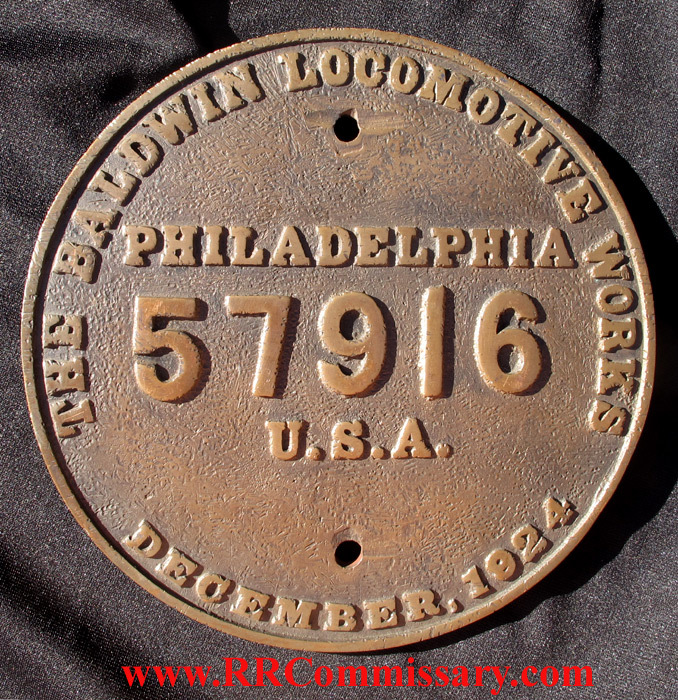 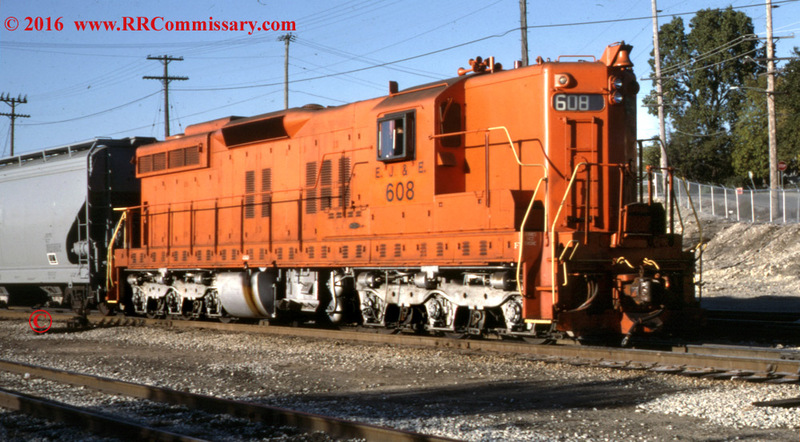 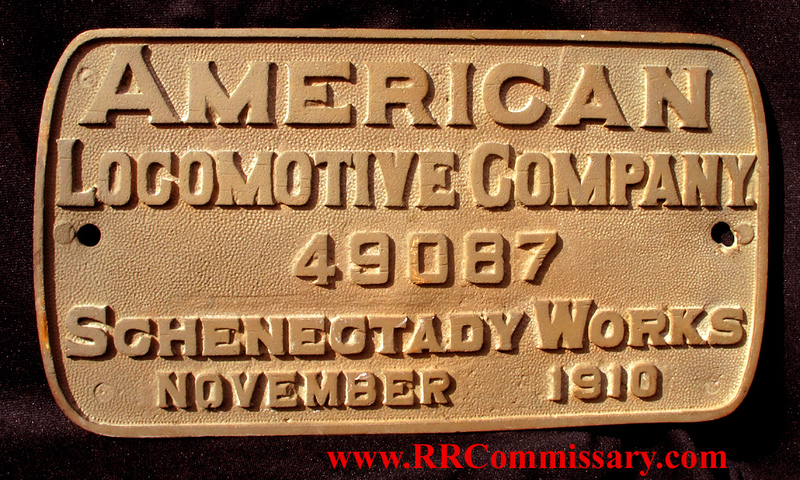 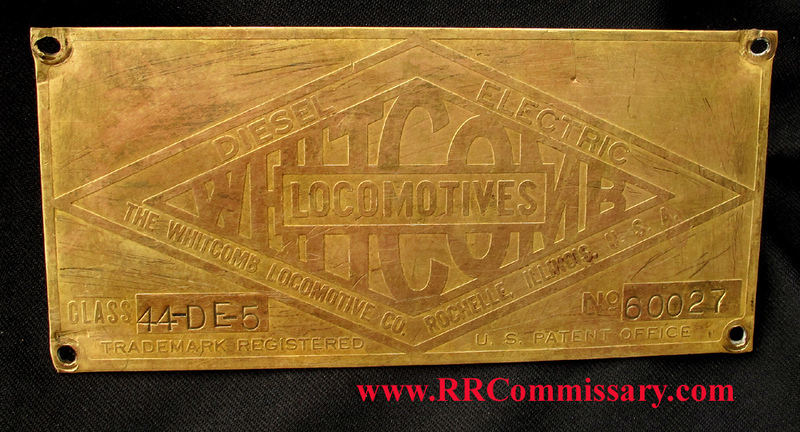 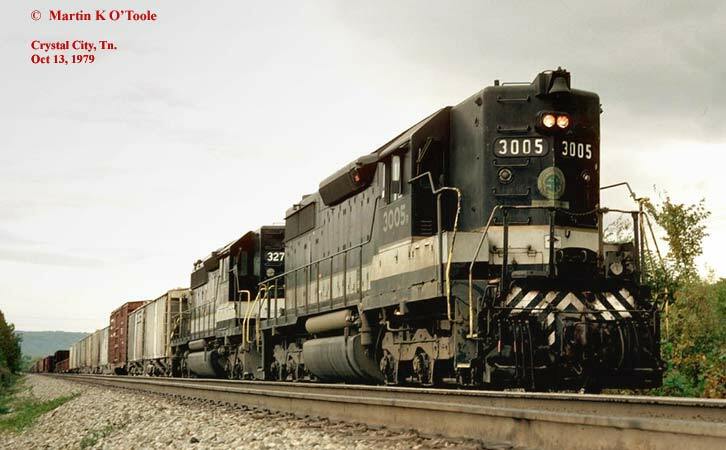 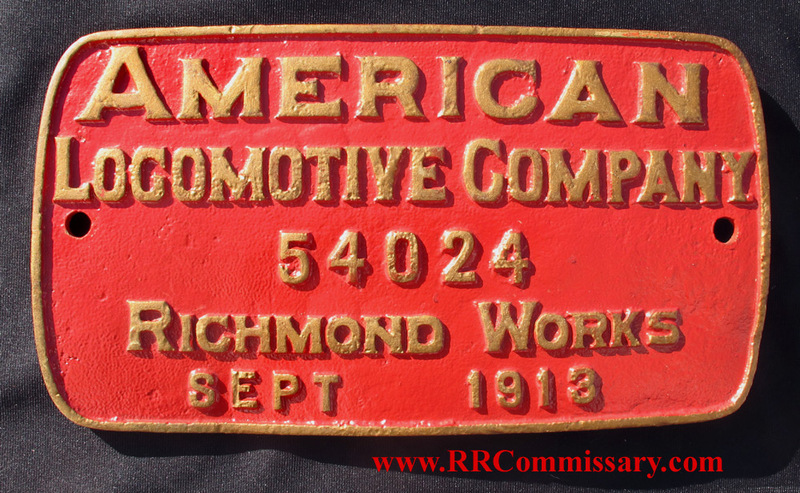 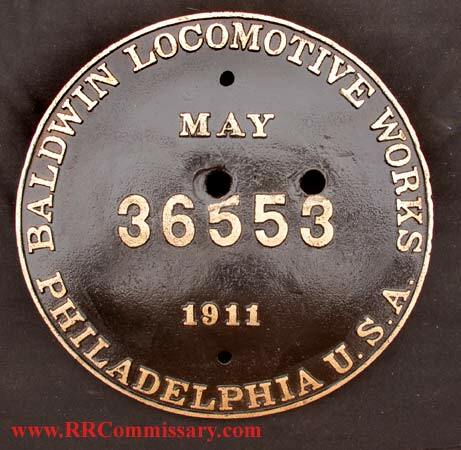 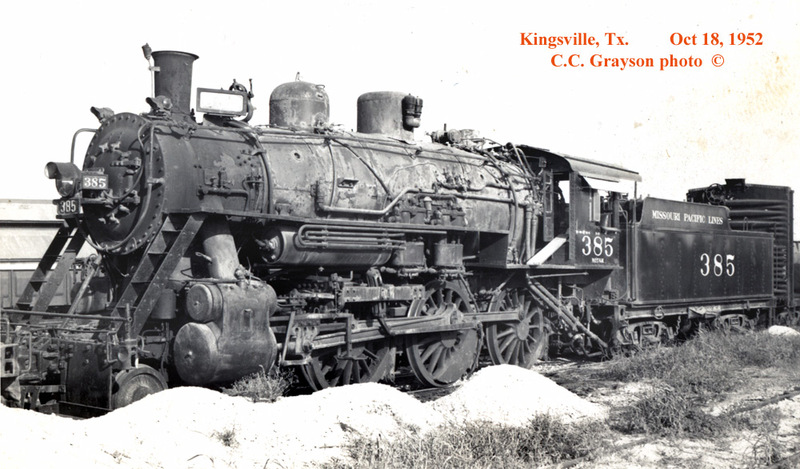 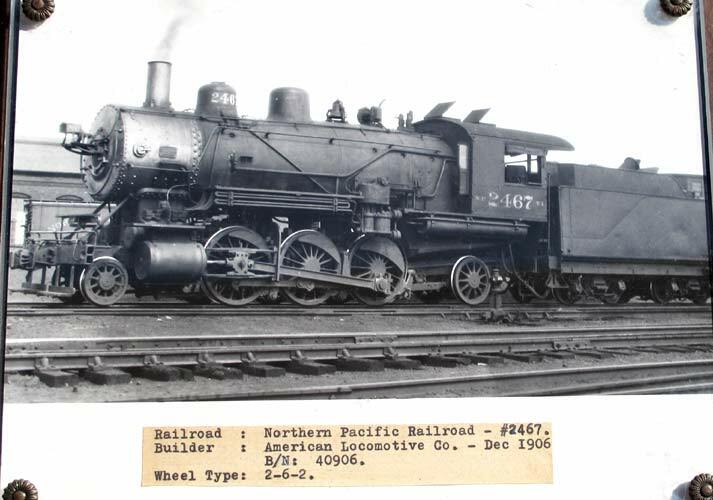 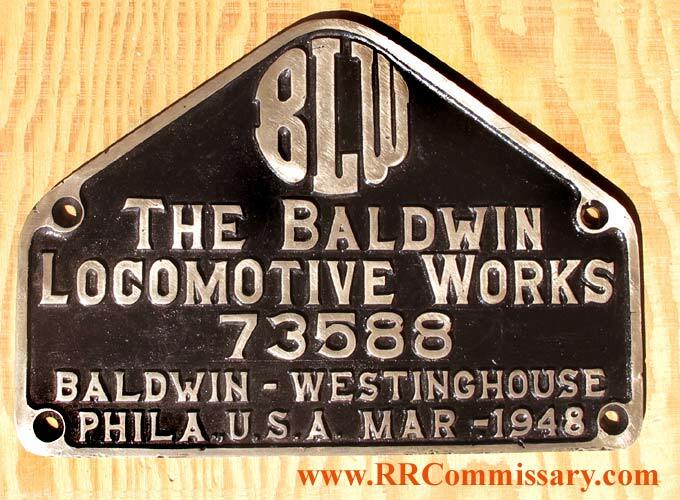 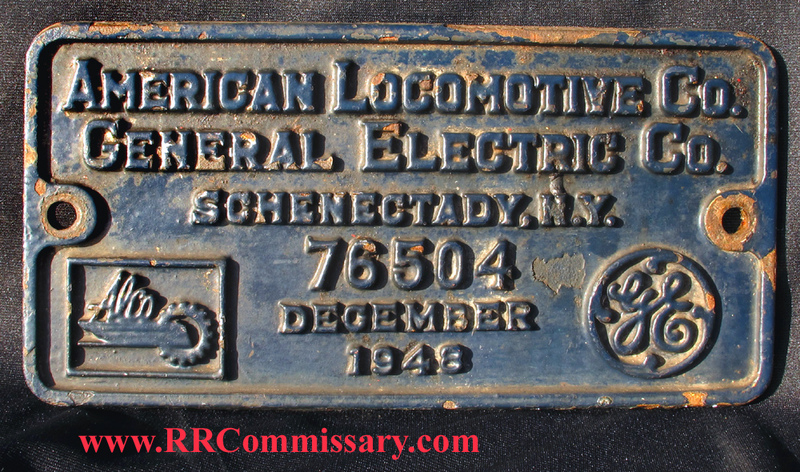 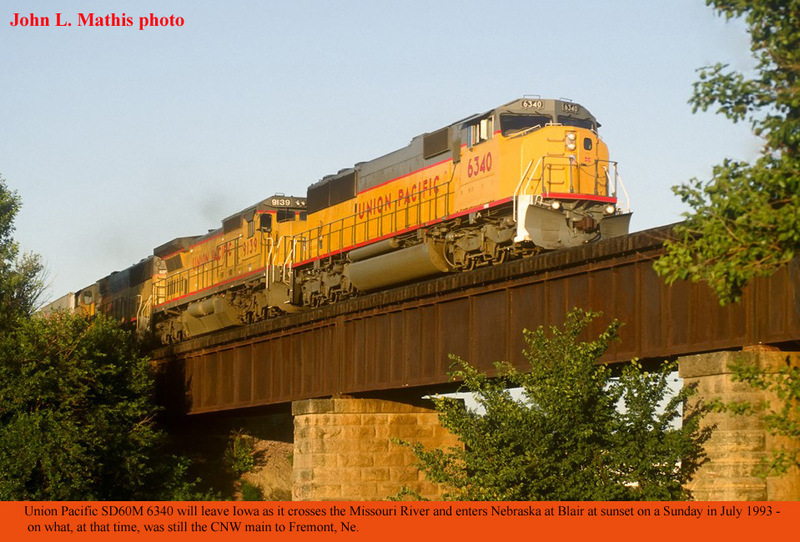 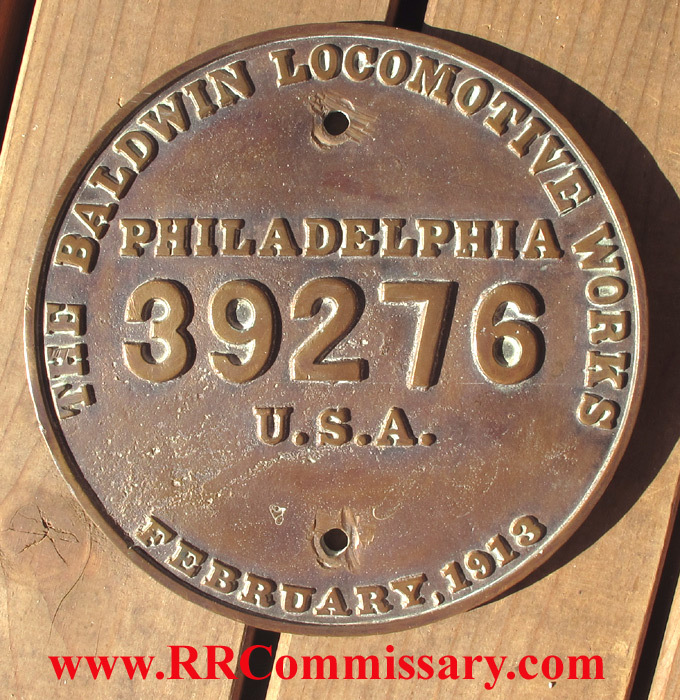 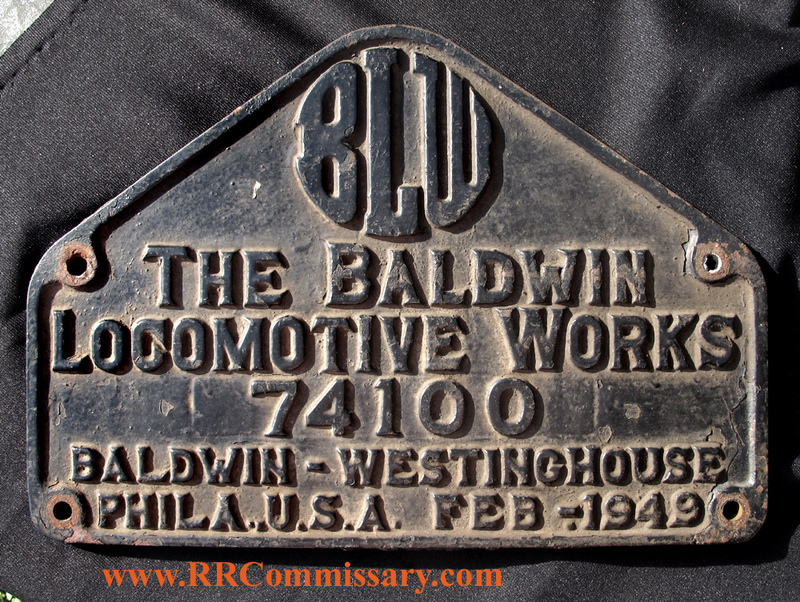 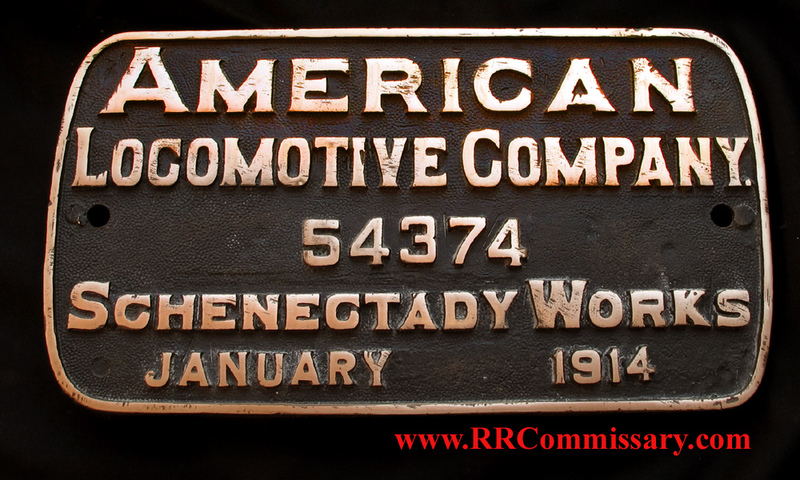 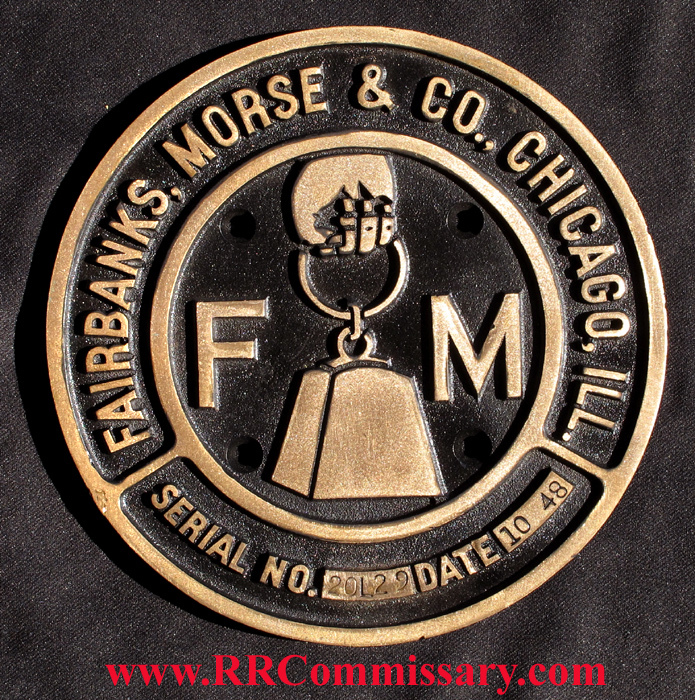 Welcome to The Railroad Commissary on-line locomotive builder's plate catalog. 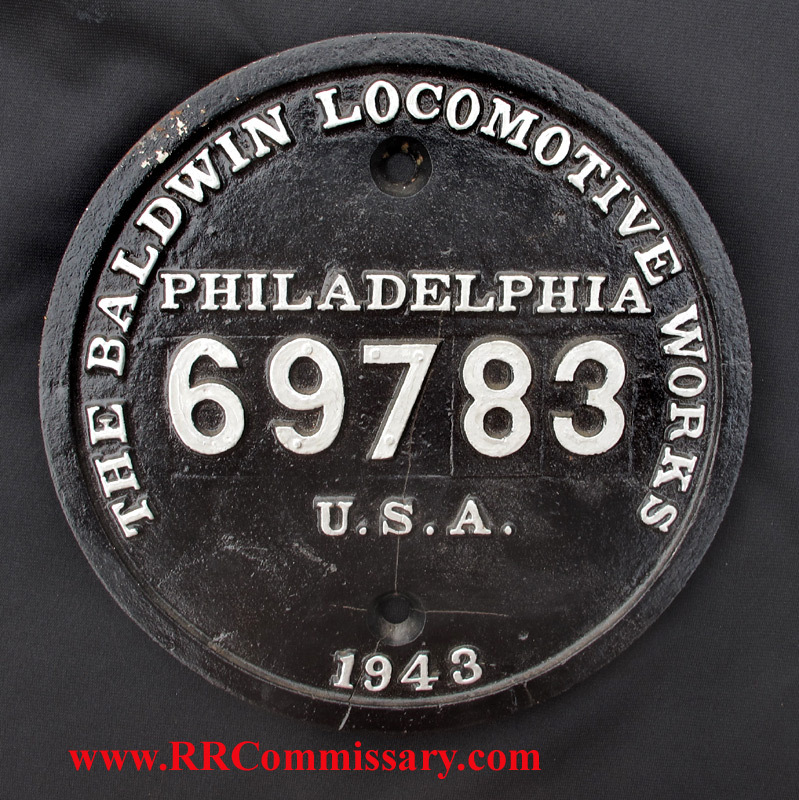 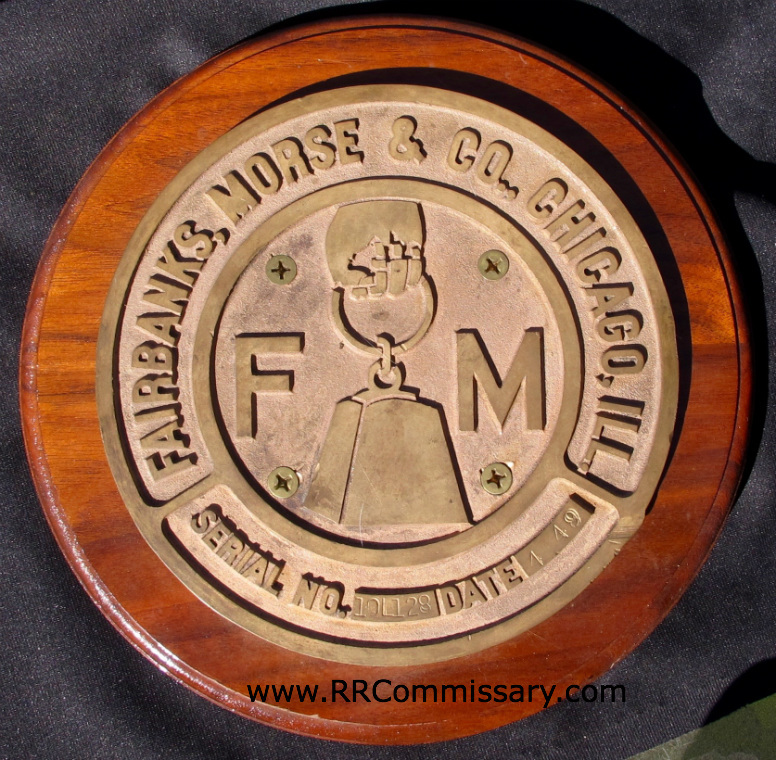 We offer a collection of railroad collectables that have been carefully selected for authenticity. 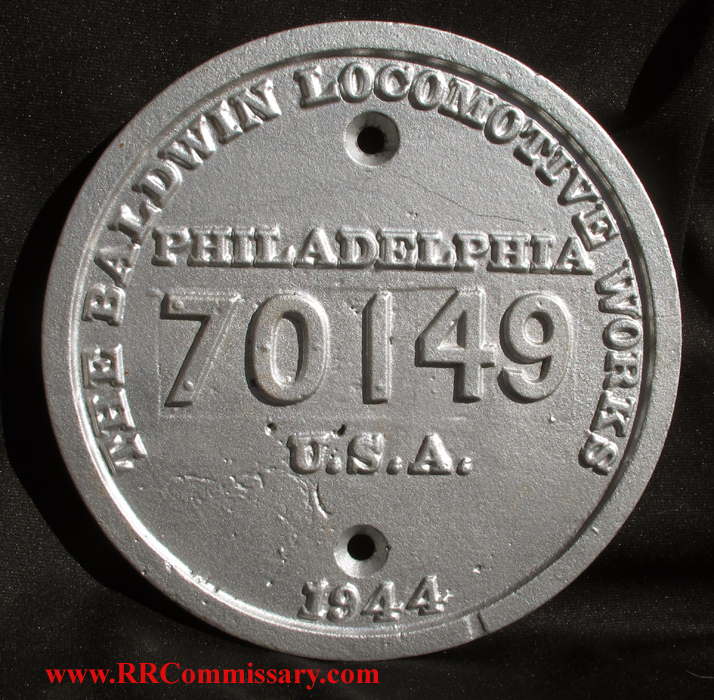 Our interest is railroad relics - unless the items actually came from a railway, we don't stock them. 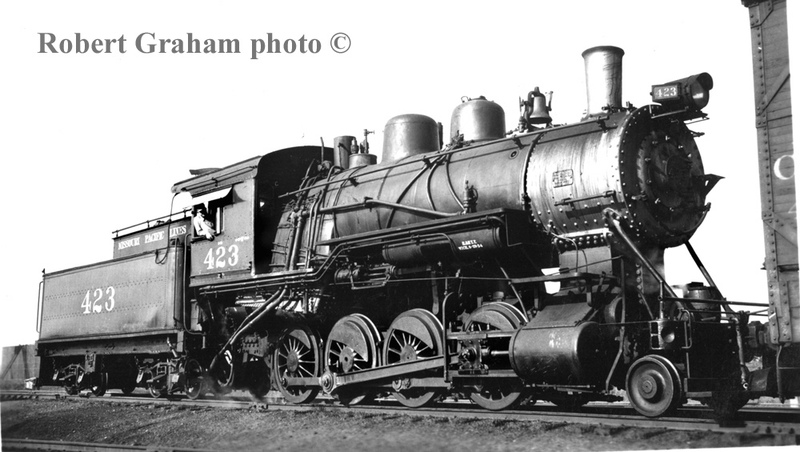 1924 - can be seen pages 76-77 and 124-125 of Colin Garratt's book The Last of Steam). 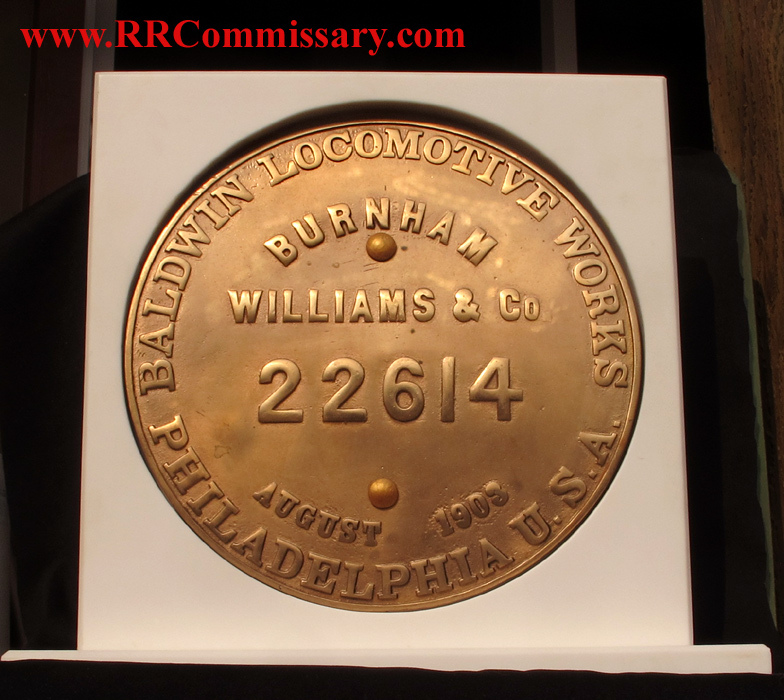 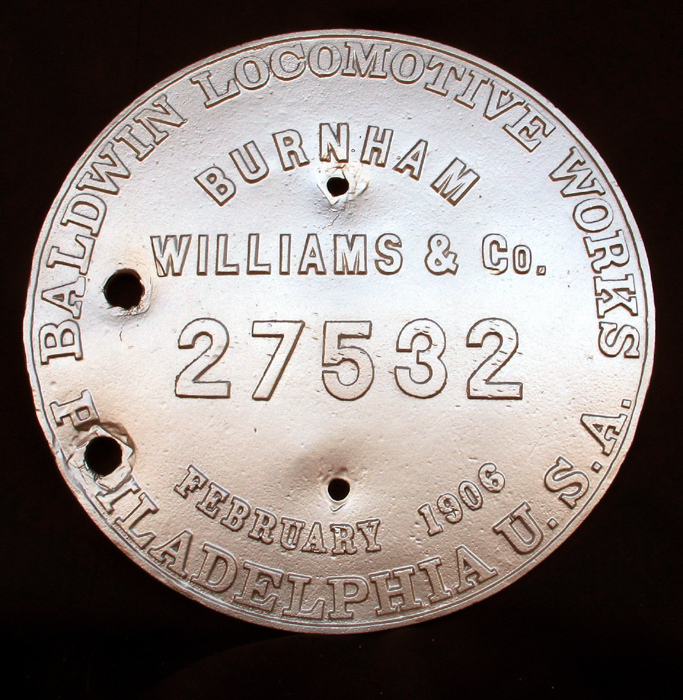 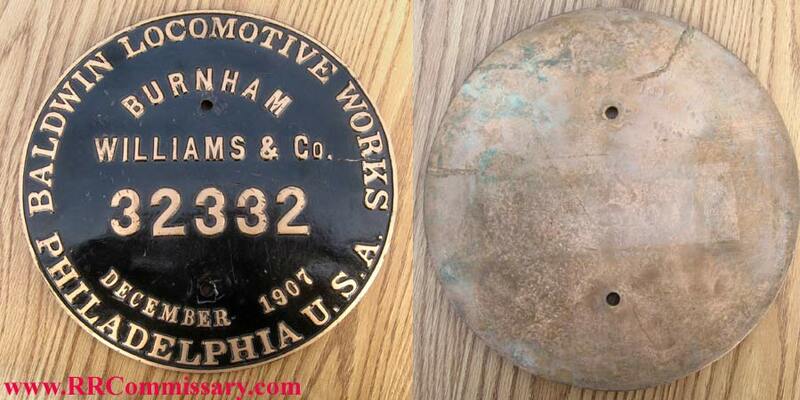 16" / Burnham, Williams & Co. cast brass "manhole cover"
(this is the left side plate. 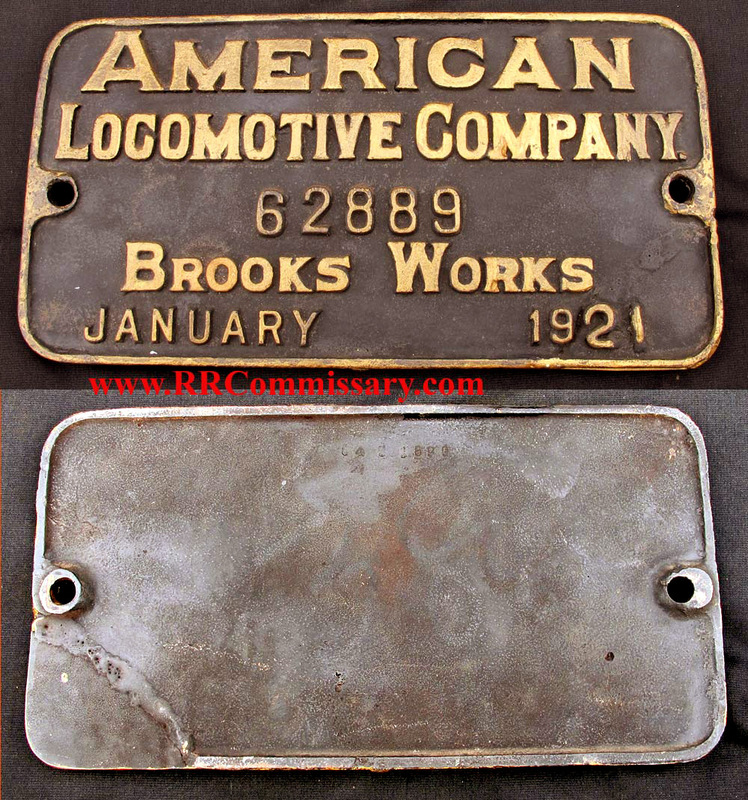 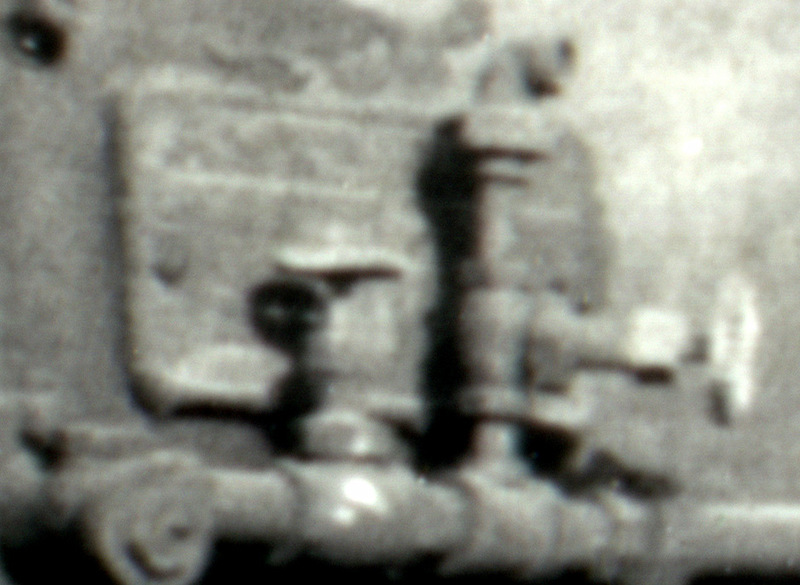 The right side plate had equal but opposite holes - as seen in photo. 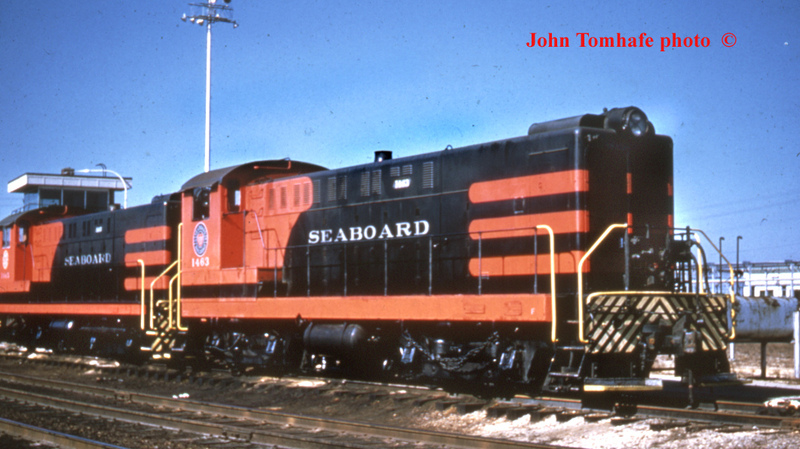 A classic, Southern, cabbage-stack, log hauler. 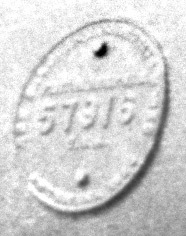 Florida State Archives has several photos of it. 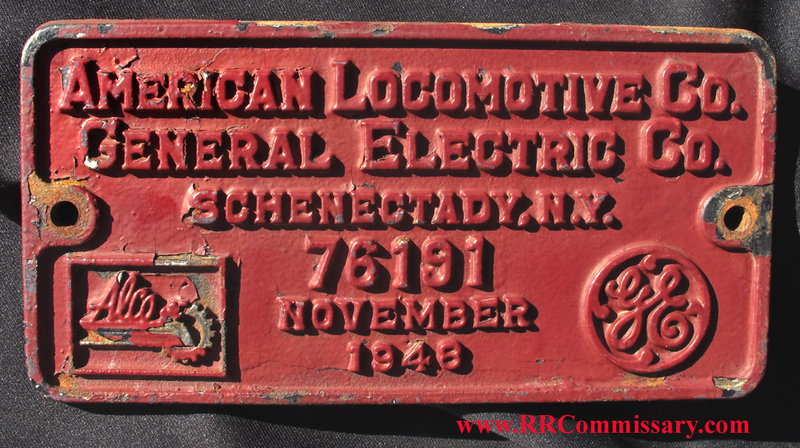 See: A-S Lumber #101 for an example. 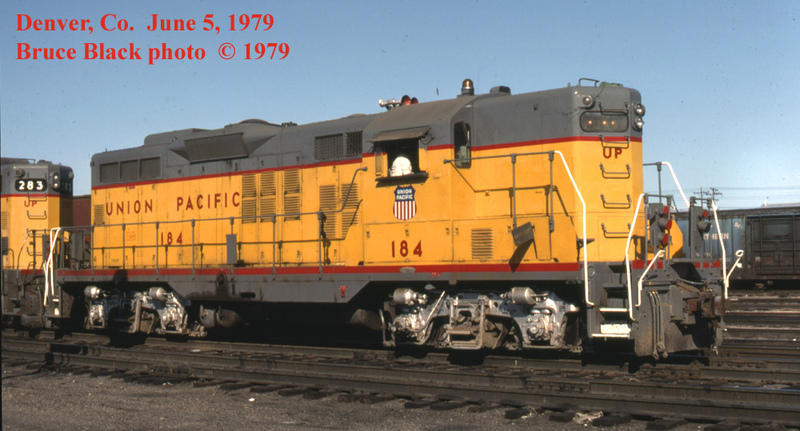 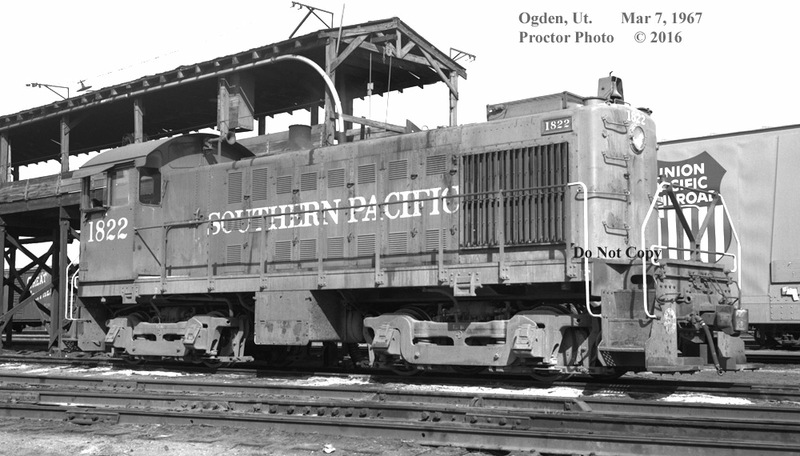 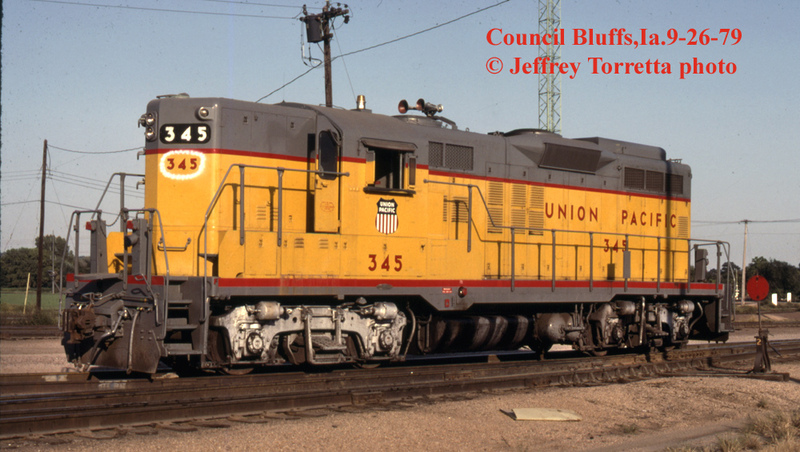 BPE-163 & BPE-164   23701    9-1957      GP9    nice / no paint left         $120.00 / ea. 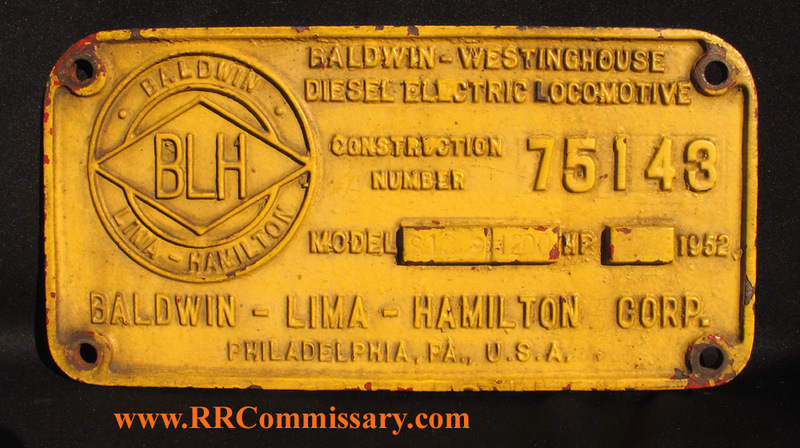 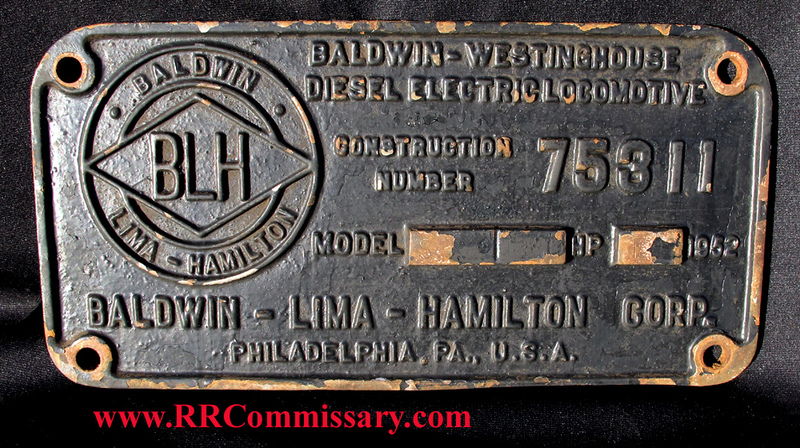 Lima Locomotive Works / Lima-Hamilton Corp.
Seaboard Coast Line  (SCL)  #?? 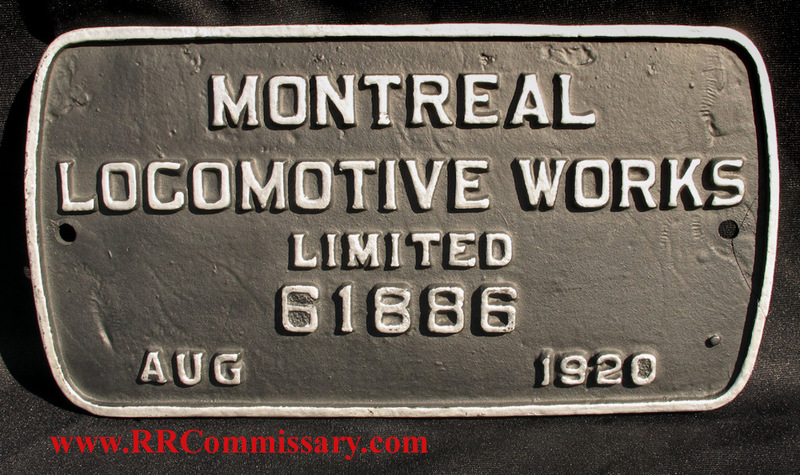 Shipping - Shipping is $12.00 per order - insurance included (to US addresses), ($15.00 to Canada up to 1 kg, $26 up to 2 kg, $36 uo to 4 kg, $56 over 4 kg), more elsewhere, depending on cost). 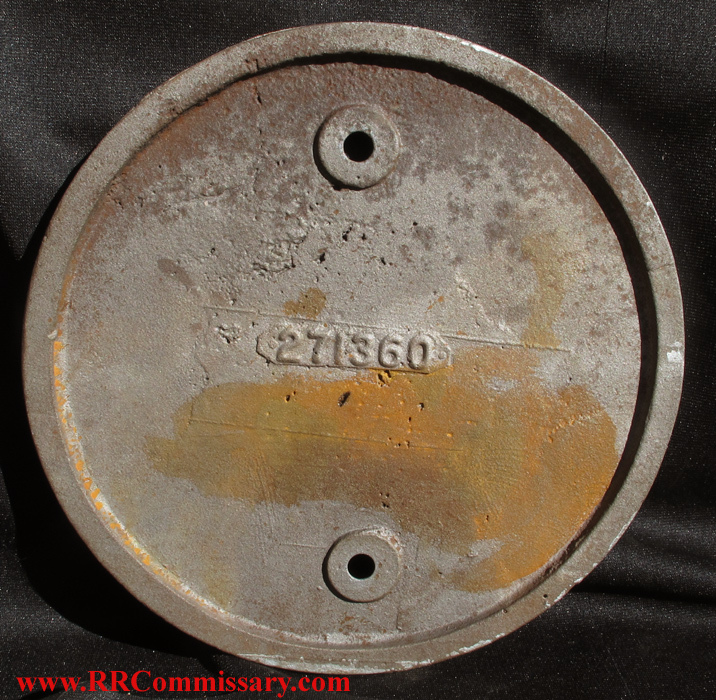 Your quantity discount will be in the shipping - buy several pieces and we pay anything over the basic rate. 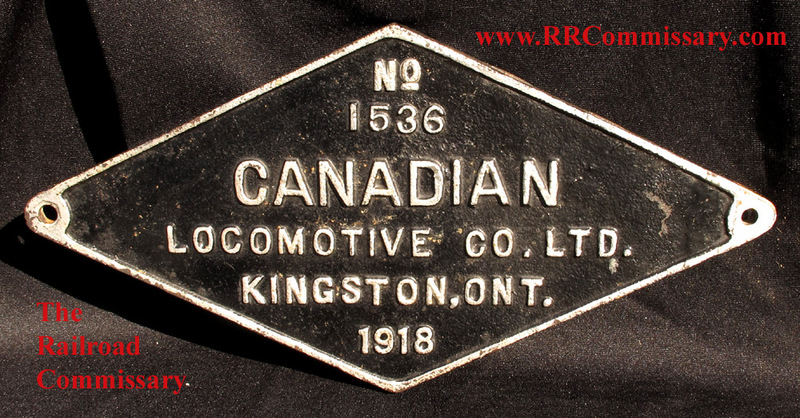 Orders over $1000 shipping is free within North America, 50% actual cost worldwide. 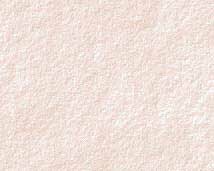 To avoid delay please order by stock number, when shown. 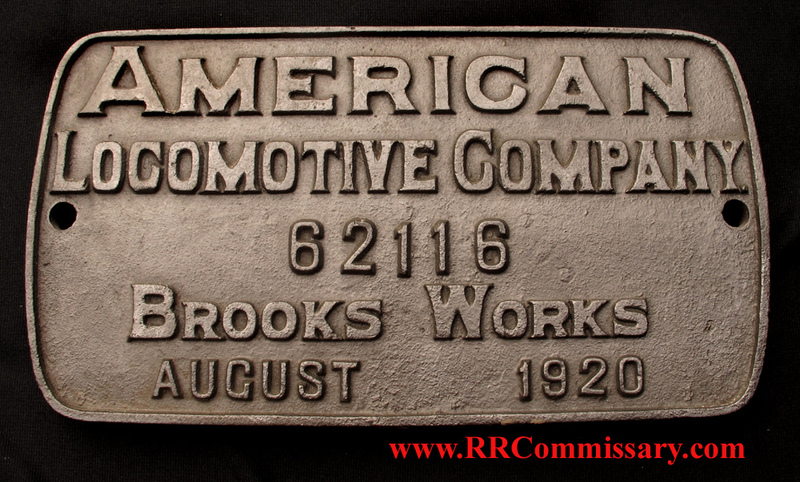 Visa and M/C, Zelle,Paypal, as well as checks and money orders, accepted. 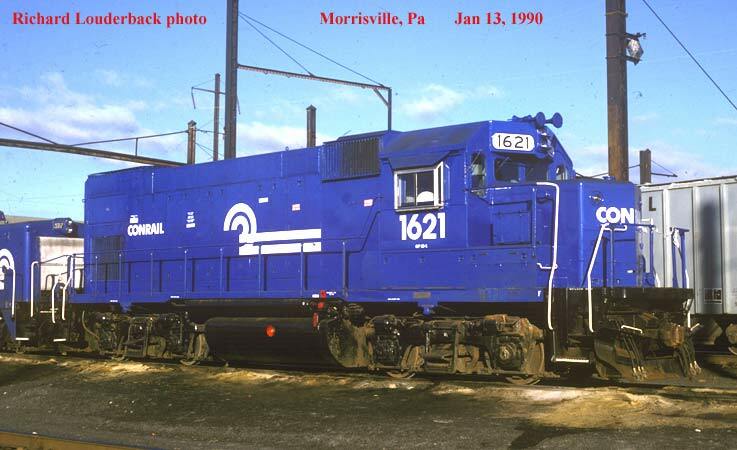 Trade / Sell - Perhaps you would like to suggest a trade ? 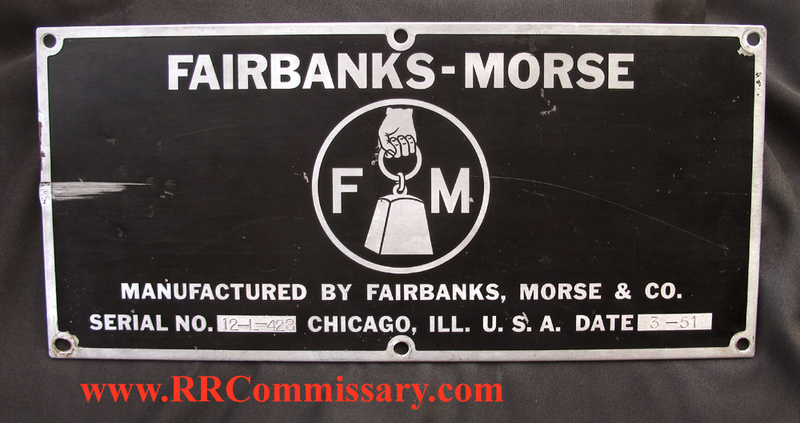 Unlike an Old World vegetable grocer, we do not care to haggle over the price of each piece, but if you think that you could suggest a trade, or other "deal," that would be mutually beneficial, we will be happy to hear you out. 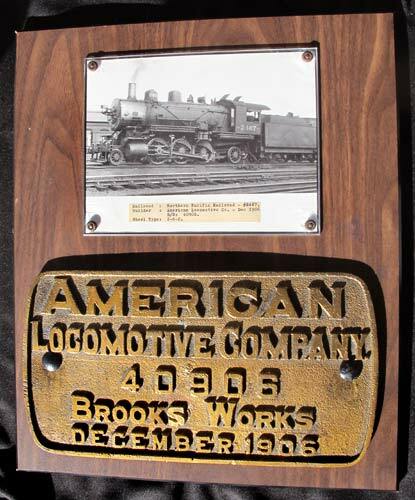 Maybe you have a piece that doesn't exactly fit with your collection, and we have a piece that does - maybe a deal could be found. 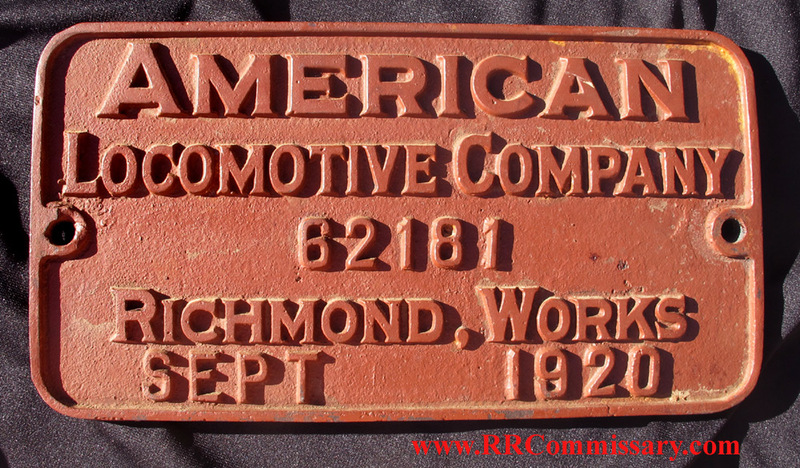 Please recall though, that this is a commercial enterprise, so we would find no advantage in a trade for pieces of like value. 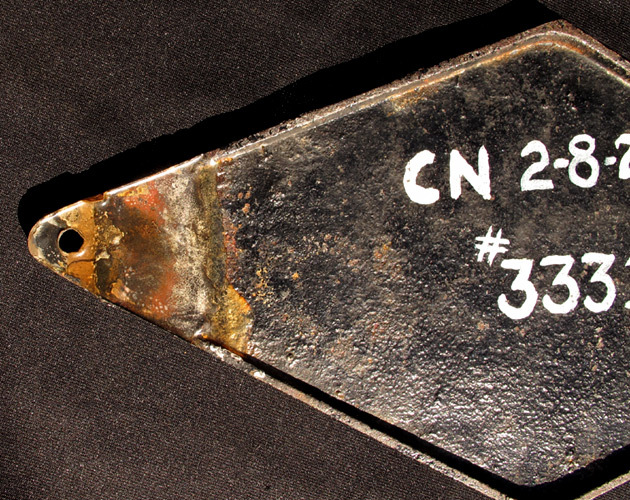 Of course, we are always buying - from whole collections to single pieces. 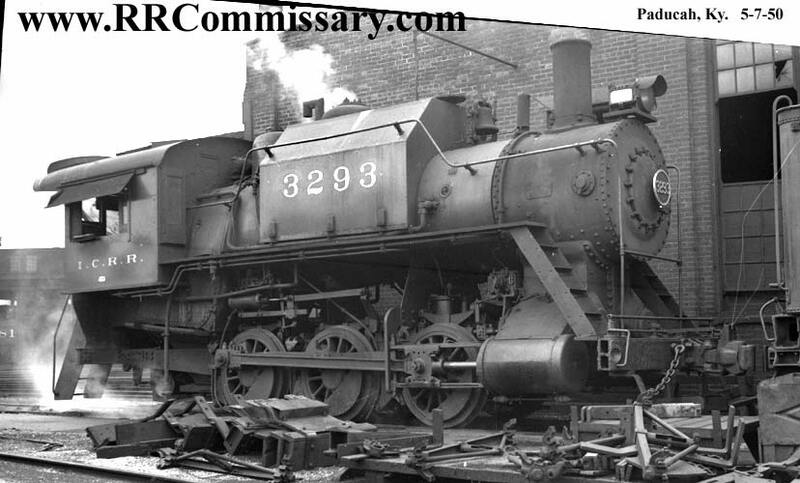 last updated 4-6-19 All images and copy on this web site are subject to full copyright protection.